RAM upgrade problem - strange timing behavior?! It is made by samsung and i purchased this specifically as it is exactly the same as the ram i currently have (at least i think). Basically when i add it to my 2 current sticks to make up 4 1gig stick windows will not start. It either blue screens after it gets to the desktop and says there is a problem with 'MEMORY MODULE' i think or it says it is shutting down to prevent damage in a black screen early in the startup. When i turn it on with all sticks in it does a memory check and says 3'xxxxxxxx bytes OK' - it should be '4xxxxxxx' for a start as it is 4gig. I have run the computer with just the new sticks in and it runs fine - however i tried it with just 2 sticks in the 'secondary slots' (the 2 slots that were previously empty) and it boots up fine - however CPU-Z tells me that the timings are all different. Normally it is 'Freq: 201Mhz' when there is RAM in the 2 first slots, but when i run it in the second two slots it varys between '157.9' and '158.0' Mhz. Any ideas? 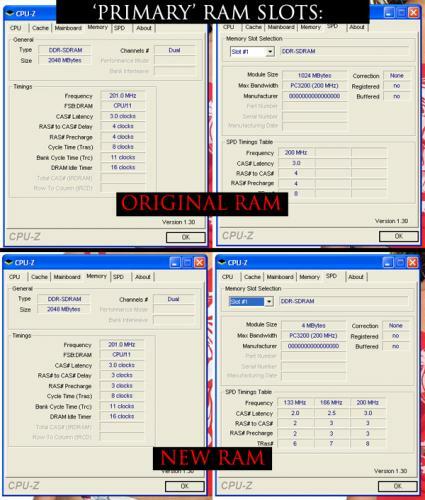 Why would the same ram run at different speeds in different slots? 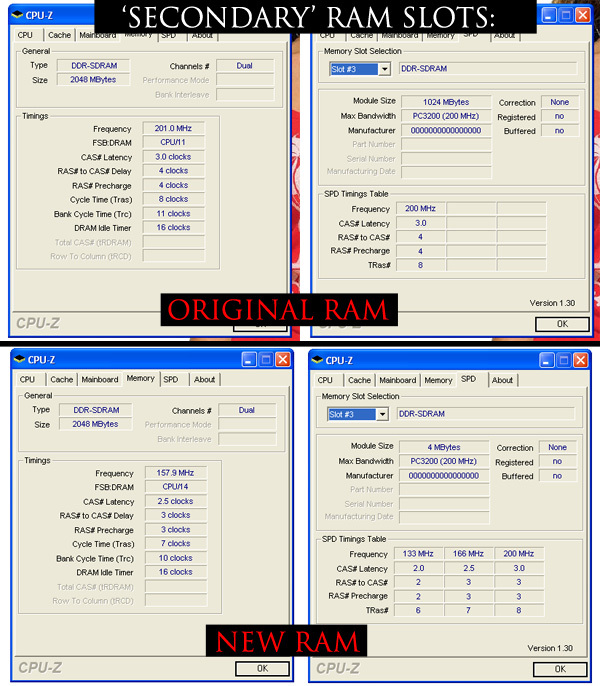 You may have to tweak the BIOS a bit to change the timings and the speed to your motherboards native. Also please make sure that the sticks are the same and if they are try mix and matching them to see which one is the faulty one. thanks for the reply - here is an update. I have tried all the RAM in their pairs in each 'set' of slots. The results are a little strange - although i am no expert - i have attached screengrabs of the CPU-Z timings for each combination. and on the SPD tab my original RAM only shows up in one table @ 200MHZ where as the new RAM shows up in all 3 columns @ 133,166 and 200Mhz. When i try to run the RAM all together i either get a blue screen saying problem with 'MEMORY MODULE', or 'BAD POOL HEADER' - or it stalls on startup just before it would normally say 'Veryfiying pool data'. So any ideas? It seems all the RAM sticks are fine as they run no problem in their respective pairs in the primary slot, aswell as the original stuff running fine in the secondary where as the new stuff works in the secondary but seems to run slow. I should add recently every time i turn off my computer i have to wait at least 5 mins b4 it can turn back on else the fans just turn a few rotations and nothing happens when i try power it up straight away - a PSU problem? could it be related? I don't think its a PSU problem since that memory is old and doesn't consume as much power, however if the voltages were changed in the BIOS then we will surely have problems. Can you tell us if there is an option in you BIOS that allows you to change the Memory timings and voltage? If not then try reseting everything in the BIOS to defaults and then restarting, if that also fails then we have to remove the CMOS battery and put it back, but lets hope we don't come to that. Thanks for the reply. I have been into the 'dual bios' and i cant find anything on timing but i found a setting called 'DDR Voltage Control' which was set to default - should i look into this? I also found 'CPU Freq' set at 200, and 'PCIE clock at' 100Mhz - dont think these have anything to do with it but thought id put them down incase. I then used 'load optimized default settings' in bios and it rebooted - i then put the extra RAM in again and no change - wont boot. Do you really think it is a problem with the bios sending power to the RAM slots? - as as i said earlier the old ram works fine in these slots? I am using XP home - i read recently that it can only utilize 3gb of RAM - is the correct? if so will putting 4GB in be a problem? should i try 3GB (three sticks of 1GB) or does it have to run in pairs of sticks? This should have to do with the BIOS since the sticks and the slots are fine, I think that when you have more than two sticks the BIOS changes the voltage settings, and therefore you have to change it back to normal. Try putting all the sticks in and then going into the BIOS and reading off what it says under the DDR voltage option. XP only shows 3.5GB but it is fine to have 4Gb in it just doesn't show up as 4Gb. Edited by SOORENA, 04 March 2008 - 05:40 PM. Ok i have put all 4 sticks in and went to Bios - under 'DDR Voltage control' it basicaly gives me the option to add 0.1V or 0.2V to the standard voltage. It also comes with a warning saying it may help in overclocking but may damage the memory modules. not sure i want to try this? Could the fact that the two sets of RAM have different RAS to CAS delay and RAS% have anything to do with it as i said in my second post? My housemate is home tomorow and he has exactly the same computer as me, bought on same date from same manufacturer etc - i will try and use his 2 sticks as my 3rd and 4th sticks and see how that works as it will be exactly the same RAM. One last thing - are you saying that XP can utilize 4GB even tho it only shows up 3.5GB? Actually now that I read what I wrote it sounds as if I said that, lol, what I meant was that Xp can only use upto 3.5Gb even if you have 4Gb, however in Vista they have fixed this problem and you can have the full 4Gb. This is because XP is a 32-bit operating systems, Windows allows userland programs to use only up to 2GB of RAM, the rest is for kernel use only. Since you can address only 4GB of memory with 32 bits, some of your RAM is masked by other system resources like video memory that has to be accessed too and will take out a chunk of the address space, making some of your RAM unusable. If you want to make full use of your RAM, you have to install a 64-bit OS. And for the timings of the Memory modules, is there an option where you can change this? Another suggestion would be to use you biddies 2 sticks and give him your new 2 sticks . Edited by SOORENA, 04 March 2008 - 07:35 PM. however in Vista they have fixed this problem and you can have the full 4Gb. This is incorrect. The reason you can only access 3-3.5GB of RAM is because of the 32bit limitation. This has nothing to do with the OS itself. Firstly I want you to try to boot into windows with only the new kit you have purchased. If your computer boots into windows fine, please continue with the directions below, if it doesn't work ignore the instructions below and post here telling us that it didn't work. Running 4 sticks of RAM puts a greater strain on your North Bridge. Do you know how to increase the north bridge's voltage in your BIOS? If you do, start by increasing it by +.05V, if it's still unstable, increase it another +.05V for a total of +.1V. If this doesn't resolve the issue, please do not increase the north bridge's voltage any more and revert it back to it's normal voltage. Edited by james_8970, 04 March 2008 - 07:45 PM. Oops I forgot to add 64-bit to the end, I thought the explanation would well explain, lol. Also I doubt that INTEL would put those options on their motherboards, I remember I had one and it didn't have any options , hence came the GIGABYTE, hurray! Ok, so i have tried my mates identical RAM and it works fine... except it only comes up as 3GB not 4GB which you guys said i should expect with XP. This has really made me loose faith in being able to buy compatible RAM now as all the specs on what i bought were compatible - and it even lists my motherboard as compatible . So im wasting 1GB of ram if i have 4GB - can i run 3 sticks or RAM giving me 3GB meaning i can sell the 4th? or do they have to run in pairs? By the way i do have a GIGABYTE nforce 4 SLI mother board but i couldnt find any north bridge voltage options - although it doesnt matter now. If i sent you pics and specs of my current RAM could you help advise me in buying 2* 512MB compatible RAM sticks (as i will sell what i bought as i cant utilize the 4GB)? 1. 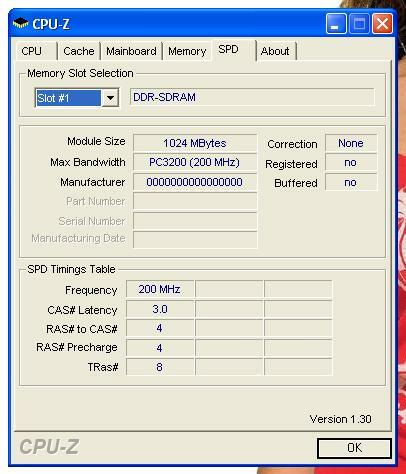 What frequency does the RAM operate at? 2. What timings does the RAM operate at? 3. What are the stock voltages of these sticks? Please be aware that we can never guarantee mixing and matching RAM will function. The market is much smaller for DDR, similar to AGP. Also the demand is in many cases larger as there are fewer manufacturers producing said product. Edited by james_8970, 06 March 2008 - 09:16 PM. 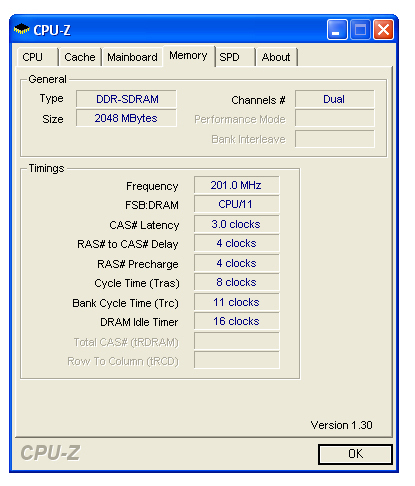 I have attached a screenshot of CPU-Z to show the timings of my current RAM. I am unsure of how to find the voltages of it though, can you advise me on how to find this? Both the sticks in slot #1 and #2 read identically. How do i go about finding the voltage of the RAM? Edited by Danstar10, 07 March 2008 - 10:03 AM.